Yemeni ballastic missile "Badr 1"
Yemeni army forces’ missile force have targeted Saudi Industrial City in the kingdom’s southern provinces of Jizan with a missile in response to the US backed Saudi-led coalition’s fatal and nonstop airstrikes that claimed the lives of many citizens today and over three years. A military source, speaking on condition of anonymity, told YemenExtra that the missile force of the Yemeni army forces hit the Indusrtial City with Badr 1 missile in Jizan. In Jizan, they also attacked Saudi army’s paid fighters and controlled several hills off Dood and Dukhan mountains, killing and wounding dozens of them.They also fired katyusha rockets and artillery shellings toward Saudi army’s sites in southern Saudi province of Jizan, targeting the sites in Muqrin and Otema centers. Furthermore, They hit the Saudi army posts in Jizan front, whereas the rocketry and artillery force targeted Al-Muqrin and Atma centers of Saudi Arabia in Jizan with barrage of Katyusha missiles and a number of artillery shellings. In Asir, a paid fighters was shot down by army’s snipers off Alb crossing.Army’s missile and artillery shelling targeted gatherings of the paid fighters off the same crossing. They , in addition, stormed Saudi sites in Najran border province.They killed Saudi soldiers and destroyed three military vehicles during storming Hajlah and Mothalath sites. 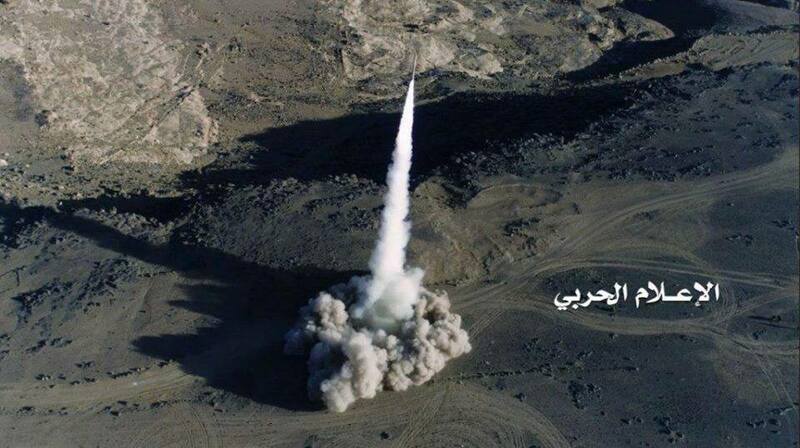 They fired a short-range ballistic missile toward a coalition’s paid fighter camp in Marib province.The missile targeted Mostahdath camp of the paid fighters, inflicting the paid fighters heavy losses in lives and equipment. They fired Zilzal-1 missile on gatherings of the paid fighters in Jawf province, hitting its target precisely in Maslup, inflicting the paid fighters heavy casualties. For the coalition part, six civilians were killed , including four women and a child ,in a coalition airstrike on Hajjah province in al-Jer area of Abs district. The death toll from the coalition airstrike on the Bedouin tents in Amran province rose to 12 civilians .At least three children, two women and two civilians were killed and other five were injured when the warplanes launched strike on the tents in Ashmiah area of Harf-Sufain district, then the warplane resumed air striking the tents, killing five other civilians. A woman was killed by the coalition missile and artillery shellings in Munabih border district in Saada governorate. The coalition paid fighters also targeted densely populated villages in Razih and Baqim border districts in the same province.The coalition also launched three raids on citizens’ properties in Baqim district. Two citizens were injured as the coalition warplanes waged airstrikes on Saada province,targeting a citizen’s car, wounding two civilians in border Baqim district. Deputy Awqaf Minister for Hajj and Umrah sector Abdullah Amer , for his part, said that Saudi authority prohibited the Yemeni pilgrims to exert religious ritual for the fourth year.He stated that the Saudi move comes as part of the ongoing campaign to exploit the religious ritual for political purposes.The Saudi regime imposed high fees on the Yemeni pilgrims and put all obstacles on their way. In March 2015, the coalition started a war against Yemen with the declared aim of crushing the Houthi Ansarullah movement, part of the Yemeni army forces ,who had taken over from the staunch Riyadh ally and fugitive former president Abd Rabbuh Mansur Hadi, while also seeking to secure the Saudi border with its southern neighbor. Three years and over 600,000 dead and injured Yemeni people and prevented the patients from travelling abroad for treatment and blocked the entry of medicine into the war-torn country, the war has yielded little to that effect. According to several reports, the coalition’s campaign against Yemen has driven the impoverished country towards humanitarian disaster, as Saudi Arabia’s deadly campaign prevented the patients from travelling abroad for treatment and blocked the entry of medicine into the war-torn country.